This is an edited copy of my original post published on Tnooz. 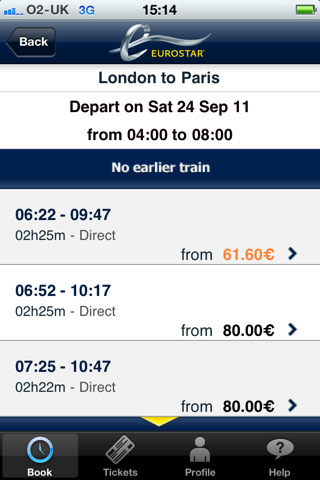 Following the move of many other travel players, Eurostar has released mobile apps for Android and iOS devices. 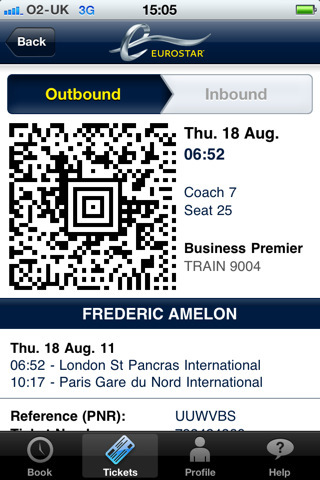 mobile boarding passes officially usable! The app is well designed with simple navigation and functionality: bookings, tickets, user account, help. However, it relies on always-on data network, even for static information like help, user profile data and existing bookings. Boarding passes do not remain permanently stored locally, which is going to be a critical problem when travellers check-in abroad, without data network access (this behaviour seems random, so it could be just an early release bug). The booking process is quite straightforward, with an innovative horizontal train-shaped slider to select depart and return stations with a single tap (even with big fingers). It’s a smart idea to exploit the short depart/return train station list into simple interaction, instead of using classic input boxes or dropdown lists. Dates selection follows the same easy tap concept, with the next 7 days easily laid out on a horizontal slider. For further dates, a classic rolodex-style calendar pops out. Unfortunately, the return date is not automatically adjusted to the departure date. Availability and pricing is displayed by order of train departing time, with an intuitive vertical scroll layout, and expandable panels to select the preferred class of service and rate. Payment happens through entering credit card details as on the web site. Input fields and checkboxes could be made bigger to make them more easily tappable with fingers. A mobile booking is not immediately available in the booking list, which is a bit disconcerting, but after a few minutes there it is. The synch can also be triggered manually. Booked itineraries come ready with oneway or return mobile boarding passes, using aztec 2D barcodes. The barcode can be displayed on the phone to go through the check-in gates automatically. Using barcodes on smartphones used to work even previously, by displaying the code from the PDF file – however they were not officially accepted and travellers were still required to carry the printed tickets. It’s possible to use the mobile apps to book for multiple passengers, however mobile boarding passes are only available for 1 pax bookings (the phone owner). Tickets for multiple people will need be printed at home or at the station kiosk as usual. The major gap compared to the web booking process is the lack of seat selection functionality. For frequent travellers, the ability to chose at least the coach number is critical, because of the availability (or lack) of power plugs in specific coaches. An area which needs further work is the user experience synchronisation between mobile and web environments. It’s quite surprising that this does not come out of the box, as everything should be handled by the same backend. For example, web or offline bookings can be imported into the app, but the operation is manual – it would have been great if the synch happened automatically. The reverse does not work at all: mobile bookings are not visible on the web user account, even when searching manually. For no apparent reason, there is a new mobile booking confirmation e-mail, which is different from a standard web booking e-mail. To a product manager, this resonates with double design efforts, double localisation, double testing, double bug fixing, and double maintenance going forward. Funny enough, the mobile booking e-mail is not mentioning mobile boarding passes at all. Instead it’s instructing travellers to print tickets at home or at the station. 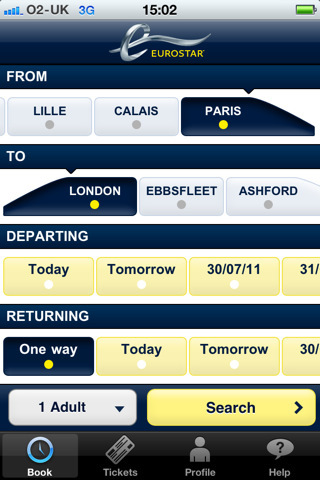 Similarly, the mobile boarding pass is not promoted/highlighted as a new option on the web booking flow. Another small fix would be to change the icon… it’s blue/greyish with a very small printed “Eurostar” title, barely visible. Eurostar’s mobile apps are a nice first step in the mobile arena, and the company has been smart to not just follow existing practices but think innovatively about improving the user experience. Initial glitches can certainly be ironed out in the next sprint, and travellers can only benefit from having direct access to bookings and mobile boarding passes in their pocket. It isn’t clear how many clicks you need to book tickets once you have made your profile page and filled in credit cared details. If you can’t book individual seats then yes for me this app would be useless. There is no point manually inputting your web-bought tickets into the mobile app individually to save two minutes printing tickets out. The only reason for me to use this app as a regular traveller would be to check ticket prices and availability if I wasn’t near a computer. Otherwise, it seems largely pointless.